Live! is the first album from SEGA rock band Crush 40, and their fourth overall. Recorded on the Guilty Live Stage in Shibuya, Tokyo, Japan on March 29th & 30th, 2012, the set list ranges from their earliest work on NASCAR Arcade and Sonic Adventure to their current musical endeavors, including the retrospective "Sonic Youth." The album was also made available as a digital download on iTunes and Amazon, with individual tracks costing ¥150, US$0.99, £0.79 (£0.99 on Amazon) or €0.99 (€1.29 on Amazon). 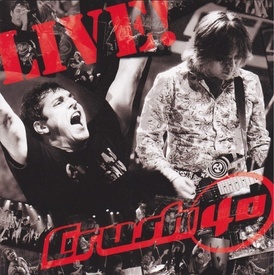 Out of the 24 songs played during the live performance, only 19 were selected for the CD, leaving "Seven Rings in Hand", "Song of Hope," "Un-gravitify", "Fight the Knight" and a cover of Hardline's "Everything" omitted. The digital version has 22 tracks, with only "Fire Woman" and "Everything" missing. And all out friends and fans for your support! This is what we want to bring to your nearest venue! This page was last edited on 9 October 2018, at 22:30.